Miles of pale golden sands, among the finest in Greece; long strands and weird fjord-like inlets all lapped by deep turquoise waters, some bubbling with the geothermal springs. This exceptionally picturesque island lies 15 miles from the south-east coast of Attica. It is also known as Tzia and this name is a remainder of the Venetian era. 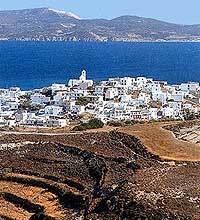 The mountain masses, which are encountered in most of the Cyclades, are broken up by small valleys sparsely planted with vines and fruit-trees and run right down to the sea, opening out into pretty little bays. The interior of the island is dotted with miniature chapels, windmills and monasteries, including that of Panagia Kastriani, Kea's patron saint. Many villages are samples of the Cycladic architecture. Otzia, Panagia Kastriani, Pisses are only few of the locations that you'll never forget. Other worth mentioned villages are Vourkari, a typical fishermen village near Korissia, Katomeria, Parameria etc. Sights not to miss include "Kleftiko" the pirates hideaway with fantastic cream and white rocks rising from the sea, the famous islets of the Sea Gulls, locally known as the "Glaronisia" the largrest of which rise from the sea at a height of 20m, the pure white lunar landscape of "Sarakiniko"which was formed by pumice fragments of volcanic origin some two or three million years ago, and "Arkoudes" rocks up to 10m high resembling bears. Adhamas – This naturally created harbor from the eruption of the volcano offers good shelter from the meltemi but should be avoided in strong southerly winds. Water and fuel are available as well as provisioning. Take time to go to the main town of Milos located on the hill the view of the crater is quite impressive. Apollonia – Located on the south side of Kimolos channel. 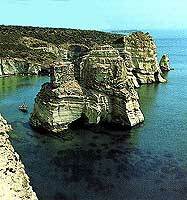 This bay offers good shelter from the meltemi. There is a small pier but the maximum depth is 3 meters. There are several tavernas and a mini market for provisioning. Pirgonisi - Offer excellent shelter from the meltemi as well as a long sandy beach for a swim. MILOS Milos is the most southerly island in the Western Cyclades. It is notable for its volcanic soil and for the rich deposits of minerals that lie beneath. During the summer summer you can find discos in Adamanta. One more disco is in Pollonia.